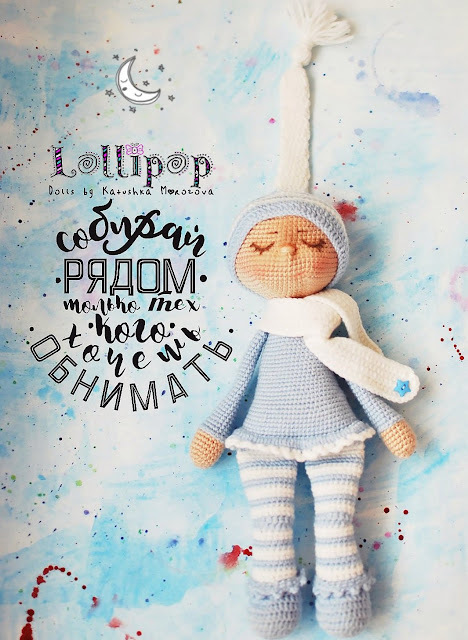 Sonia the sleeping doll by Katusha Morozova. Free amigurumi pattern. Stuff the leg. Up of leg don’t stuff firmly. R 2: (1sc, 3 ch ) in 1 sc and continue the end of row. Make sure that the legs are positioned correctly (toes are straight to you). 12 sc FLO on the first leg, make 3ch, join the second leg: 12 sc FLO on the second leg, turn the work: 12 sc FLO on first leg, sc in next 3 ch, 12 sc FLO on other leg. Attention! The marker must be on the side: we start to crochet cheeks, they must be in the front! Stuff. Up of arm don’t stuff firmly. Start 60 ch and make a circle. Make sure that this size pass to the head, if not make longer or shorter. R 1-4: hdc in every st and continue to the end of row. Keep the doll head down position. R 3: (1 sc, 3 ch) in one st and continue to the end of row. Go to the link “The sleeping doll tutorial” in the end of the post. esta el patron en español? Magnifique, cela donne envie d’en faire une. Good day, what is your hook size in mm please? It is 2.00 mm crochet hook. I’m very confused with the body. Has anyone completed this pattern in English? Can’t figure out how to download the pattern. Everywhere there is a “Download” button it is to download the PDF installer…did that already. Won’t allow me to cut/paste either. How the heck do you download this pattern? Jane, you can find in Google a converter HTML to PDF online.